Barack Obama will be elected again and when he is sworn in he better sing Michelle an original thank you song too, NO-Al Green. She is flat out carrying the over eared president through his re-election campaign. He’s been shooting bricks with his actual record and his “you didn’t build that” statements. She’s been killing it. 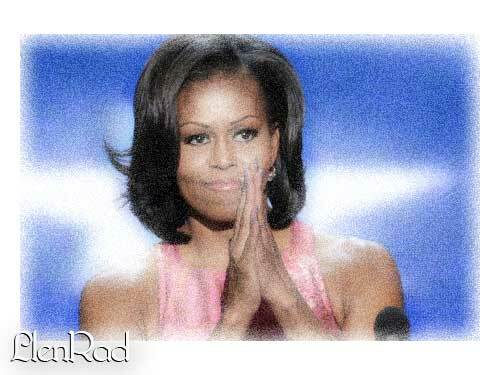 Her speech last night was the type of performance I was thinking about when I predicted Obama would win. My prediction is based on a few key facts that may be inconvenient for republicans. The secret to my prediction was always Michell Obama. Have the republicans underestimated somewhere? Her story of growing up “regular” and having to work her way to the top is the stuff of movies. More americans are in a position that matches HER story. Contrast that to Mitt Romney standing overthere the son of a governor with a wife that has NEVER worked and FIVE sons who refuse to serve in the military. The issue is a simple perception and numbers game. There isn’t enough people who relate to the Romneys, its as simple as that. You shouldn’t be getting a warm and fuzzy feeling right now if you’re a Republican. 2. Style is substance. Lets face it Michelle Obama is extremely like-able and comes off like someone you feel proud of like an Olympic athlete or something. It’s ironic because her husbands policies are basically the opposite of his peaceful rhetoric. SHE still some how pulls it off AND makes it look good. How long after the re-election before Americans realize, wa-ait a minute we’ve been duped…AGAIN?